A MAN WHO committed a string of robberies while on bail has been given an eight year sentence with the final two-and-a-half years suspended. 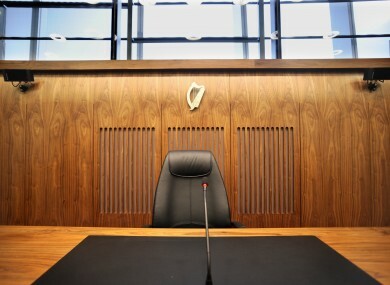 Dublin Circuit Criminal Court heard that in one of the robberies Patrick Brazil (42) stormed a shop with an imitation gun and held it to a shop assistant’s head before being overpowered during a struggle with an off-duty trainee garda. Brazil yesterday told the court that he had spent 25 years of his life in prison since first going into custody as a 10-year-old. The father of two, who has 76 previous convictions, said he was sick of prison and wanted to get his life together. Brazil of Drumalee Drive, Dublin 7, carried out a string of robberies in shops across Dublin between August 2014 and January 2016, with most offences taking place while he was on bail. He pleaded guilty to three counts of robbery, one count of trespassing and causing criminal damage and possession of a knife. John Byrne BL, defending, submitted these were “extremely serious offences”. He said his client was suffering from severe alcohol and drug addiction at the time. “He is a very different man now,” Byrne said. Byrne told the court that Brazil was now clean of heroin and methadone but noted a probation report had characterised him as someone who was “almost institutionalised” as a result of his time in custody. He said his client had a stable home environment to go to with his partner and two children. Judge Greally noted the serious nature of the offences which had been committed following his release from a lengthy prison sentence and while he was on probation supervision. She said she was taking into account his efforts to address his addictions and the difficult circumstances of his life as well as the supports he has in the community. Judge Greally imposed consecutive sentences totalling eight years and suspended the final two and a half years on strict conditions, including 18 months probation supervision. Garda Claire Rafferty told Elva Duffy BL, prosecuting, that on 29 January 29 2016, Brazil entered a shop on Oxmantown Road, Dublin 7, pressed an imitation Smith & Wesson gun to the side of the shop assistant’s head and ordered him to empty the till. As the shop worker was emptying the till, a man came to the door and shouted at Brazil to stop, before identifying himself as an off-duty garda. He was a trainee garda, the court heard. The garda retreated when Brazil pointed the gun at him, but advanced into the shop once more as he “was concerned for the safety of the shop assistant”, the court heard. A struggle ensued and he managed to overpower Brazil, kicking the gun to the floor. During the struggle, Brazil said he knew who the garda was and would kill him and his girlfriend. Gardaí arrived shortly afterwards and Brazil was arrested. He was on bail for a number of offences, including robbing two other shops in Dublin 1 and Dublin 7, breaking into Nutgrove Enterprise Park in Dublin and brandishing a knife at a shop assistant in Supervalu on Talbot Street. In one of the incidents, on 8 July 2015, Brazil pointed an imitation firearm at a staff member before robbing €150 in cash and €350 worth of tobacco. Email “Dublin man who committed robberies while out on bail gets sentenced to eight years”. Feedback on “Dublin man who committed robberies while out on bail gets sentenced to eight years”.